This essay was prepared in 2007, to accompany the exhibition at the AGA. 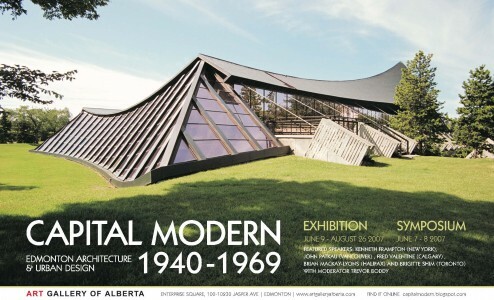 The exhibition was co-curated by 3 Edmonton architects, Shafraaz Kaba, Troy Smith and David Murray. An essay was prepared by each of us that dealt with different aspects of the extensive research. This essay followed a previous project, an Inventory of Modern Historic Resources 1939-1960 for the City of Edmonton with historians Marianne Fedori and Ken Tingley. The essay we prepared to accompany the Modern Inventory is also attached.